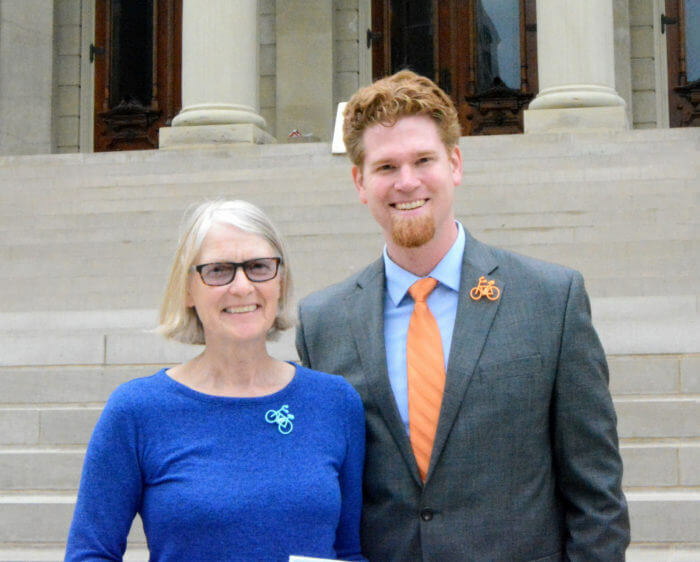 One of the Micro-Grant recipients is Pedal Holland, a program devoted to bringing true livability to the city of Holland, Michigan. Their Micro-Grant was awarded to support their 8th Street pop-up bike lane. Thank you to Meika Weiss from Pedal Holland for telling their story. “From August 21 through September 1, 8th Street was transformed into a friendlier place for people traveling on two wheels. 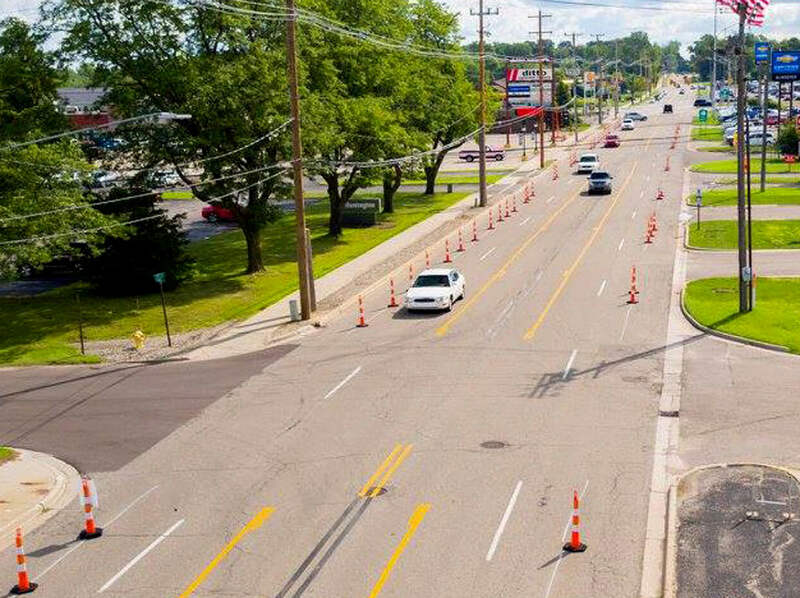 The segment of 8th Street transformed by the project is the only viable path between the core city of Holland and outlying areas in Holland Heights and the City of Zeeland. The existing street has two lanes of fast-moving vehicle traffic traveling in each direction. The pop-up bike lane exchanged one vehicle travel lane in each direction for a five-foot bike lane. It was buffered from the traffic with cones and included a center turn lane. We also added sharrows (share-lane markings) on either end of the project to link these lanes to the existing bike network. This was done inexpensively with stencils, spray chalk, tape, and cones. The 8th Street pop-up bike lane succeeded because of relationships developed over the years between the MACC (Macatawa Area Coordinating Council), the City of Holland, the Ottawa County Road Commission, local bike shops, and the Ottawa County Health Department. Volunteers from each of these organizations recruited, set up, and tore down after this event. We learned that planning a project of this magnitude is time-consuming. We hadn’t anticipated how many times we would have to get approval from different governmental agencies, and how much time we would spend waiting to appear on the next month’s meeting agenda. Our dates were delayed several times. 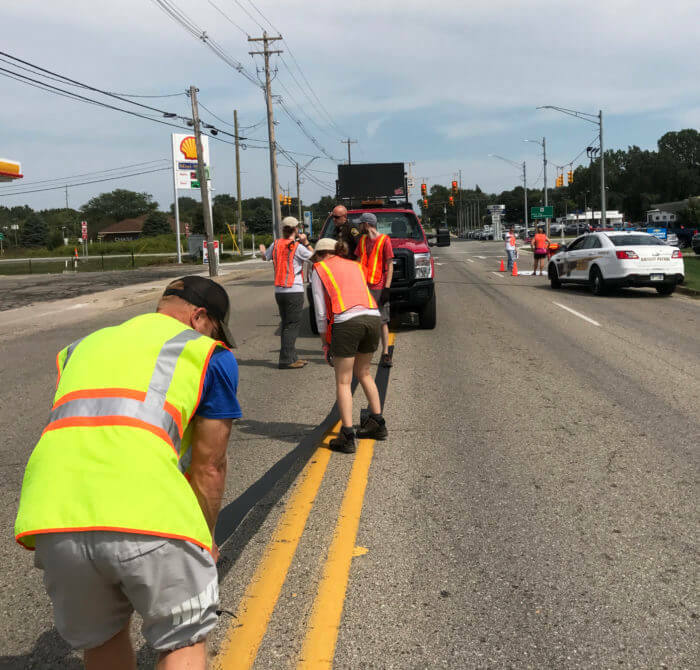 The challenge that nearly delayed the project into next year was when we discovered that the specific road tape required by the Ottawa County Road Commission was over twice the price budgeted using a different type of tape. It was the right choice – we learned that the original choice of tape would not have held up under the conditions on the road – but this increased the project budget by many thousands of dollars. The League of Michigan Bicyclists was instrumental in bringing this project back in reach.